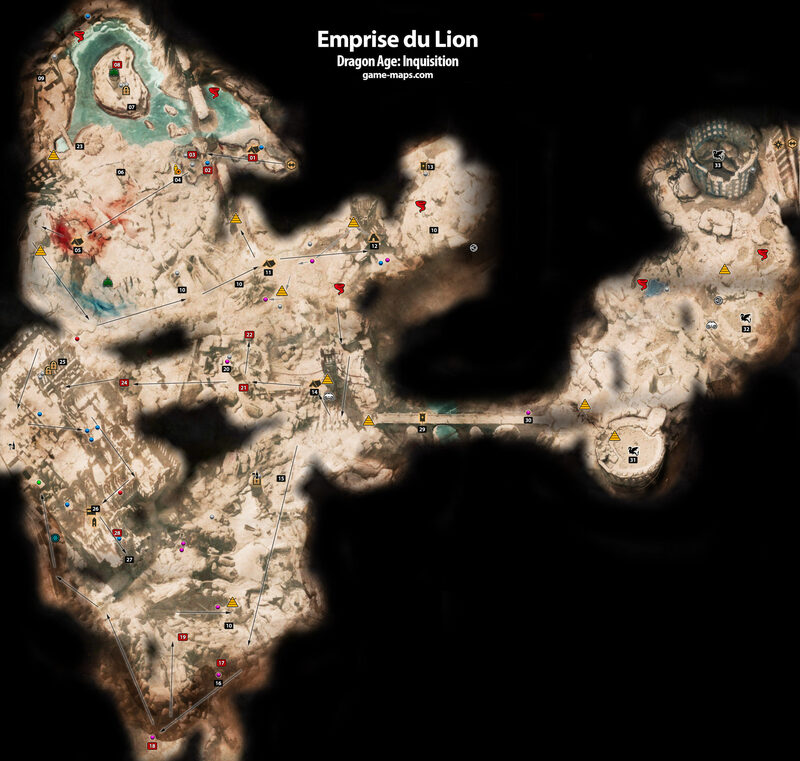 Emprise du Lion - Dragon Age: Inquisition Walkthrough, Game Guide and Maps, with Quest and Locations of Camps, Merchants, Rifts, Ocularums, Astrarium, Dungeon Entrences, Landmark (POIs), Crafting Station, Mosaic Piece, Inquisition Agent, Secrets, Party Members, Bottle of Thedas and Codex Entry. The ancient and the modern co-exist in the highlands of Emprise du Lion, where relics of the lost elven nation are scattered among bustling human villages. These hills are home to the village of Sahrnia, known throughout Orlais for its quarry, which produces azure granite of remarkable quality. The hills of Emprise du Lion are in peril. A maidservant recently returned from visiting an uncle in Sahrnia spoke of gruff, helmeted men about the village's quarry, and the appearance of strange red crystals in the fields close by. I suspected red lyrium and sent men to investigate, but the bridges leading to the area had all been destroyed - the red templars' handiwork, I wager. If we do not act quickly, all of the highlands may be lost. I wish I bore fairer tidings, my dear. My warmest regards to your family. I pray for the quelling of these winter winds of chaos, that we may meet again in springtime. Michel will join Inquisition after you finish Call Me Imshael Quest, killing Imshael. Find The Key Valeska's Watch, key in Secret near entrance. Inside you will find Landmark to claim. Kill all enemies and Energize breach. Operation: Find the Cradle of Sulevin at the war table. This will open you entrance to Cradle of Sulevin from war table. You will need rogue to open cages. Location of Villagers are marked on map. Kill Templar Mage or Templar Lieutenant to get the quest. QUEST: Red Captors Locations of enemy are marked on map. Return to (02) with ring. QUEST: Sifting Trough Rubble go to (30) after restoring bridge. 23 Place for Words Not Hollow Quest. ITEM: Felandaris Rare herb for Letter from a Lover Quest in The Hinterlands. NPC: Demon Imshael Fight Imshael don't alow him to fool you. Go to Ser Michel (04) and tell him about Imshael. Return to War Table and select Restore Judicael's Crossing Operation. Return to Baron Eduard Desjardins.